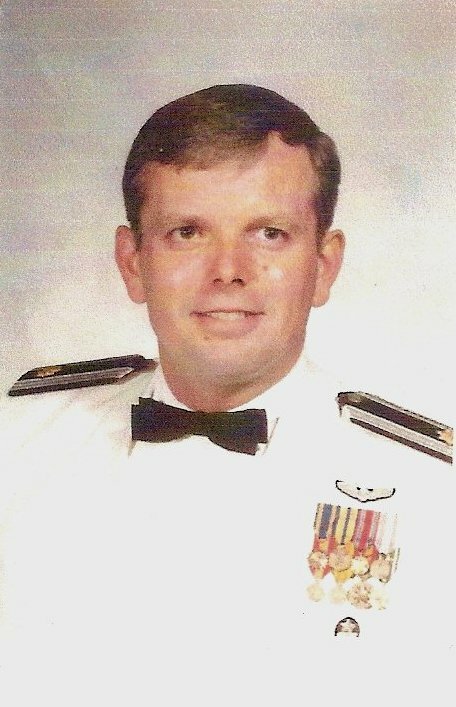 Donald Robert Fowler, Lieutenant Colonel, United States Air Force (retired), age 58, died 16 November 2003 at home in Arlington, Virginia, after a long and heroic battle with cancer. His funeral service was conducted 10 December 2003 at the Old Post Chapel on Fort Myer and his ashes were put to rest in Arlington National Cemetery. Survivors include his two children Katie and James Fowler, two grandchildren Cira and Chase, former wife Jean Fowler, brother Jonathan Burke, sister Mari Moe, nieces Angi, Amy and Nicole, nephew Ryan, aunt Annette Herman and uncle Ben Olsen. Donald Robert Fowler, aka “Mad Dog” was born on 10 August 1945 in Philadelphia Pennsylvania. He grew up in Racine, Wisconsin, and attended the University of Wisconsin where he was the chaplain and social chairman of his fraternity, Theta Chi. In 1965 he dropped out of school to join the Air Force. After completing his basic training he was stationed in Omaha Nebraska, where he was able to continue his education earning a bachelors degree in History from nearby Bellevue University. He later earned his MBA from the University of North Dakota. Shortly after earning his degree, then Sergeant Fowler applied for Officers Candidate School and received his commission in 1967. He was trained as a Navigator on B-52’s and served in the Viet Nam war from 1970–1973 flying out of both Guam and Thailand. Lieutenant Colonel Fowler finished his military career in the Pentagon's Organization of the Joint Chiefs of Staff as program manager for factory and industrial base support where he coordinated the activities of the Joint Chiefs with the Department of Commerce, the Federal Emergency Management Agency, and the Canadian Department of National Defense. Retiring from the Air Force on 31 December 1986, he formed F&F Associates, an advisory service in planning and programming, trends analysis, and executive coaching. Clients included the Department of Energy Y-12 plant Oak Ridge Centers for Manufacturing Technology, Lockheed Martin, Office of Naval Research, Oak Ridge National Lab, Litton TASC (Ballistic Missile Defense Organization and the Defense Airborne Reconnaissance Office), the UBS investment firm of Warburg Dillon Read, and the National Coalition for Advanced Manufacturing. I had the privilege of knowing him and calling him both friend and mentor. Our relationship was akin to that of brothers. We both shared a deep respect for our country and neither of us ever thought that being patriotic was politically incorrect or no longer necessary. He always treated everyone he met with respect regardless of their status or background and seemed to never forget a name. He was in fact, one of a kind that will be missed but never forgotten. I was sad when I had to say farewell to my friend “Mad Dog.” It was on that rainy day in December that his earthly ashes were put to rest in the Gardens of Stones, as Arlington National Cemetery is sometimes referred to. Although I have shed tears, I have only mourned the passing of his physical presence because his spirit is with me always. I truly hope that in the next lifetime, we recognize each other again and if only for a brief moment, exchange a smile and a story of remembrance.